The November Daily Goodie Box came with all the items below, keep reading to learn a little more about each one below. These crystals are a nice twist on a cup of tea. You combine the crystals with hot water and are ready to enjoy a sweet tea with a little spice kick from the ginger. I like that the crystals are individually packed, and you can alter the intensity of its flavor by adjusting the amount of water you use. Prince of Peace sure knows how to make ginger the main star in its’ products! I was a little hesitant on trying this when I opened my Daily Goodie Box, because I am not a fan of sleep aids, but after reading the ingredients and learning that the capsules were a drug-free combination of herbs I went ahead and tried them out. I don’t have problems sleeping, but there are nights where it takes me almost an hour to fall asleep. I tried one of these capsules 30 minutes before I hoped to sleep, and it did help me fall asleep in a nice and calm way. Slept through the night, and woke up feeling good- no groggy feeling.Â Napz are a nice alternative to sleep-aid drugs, since they are natural, which means none of those nasty side effects of over-the-counter sleep aids; and are non-habit forming,Â so you don’t rely on them to sleep. Check them out! While it was not as spicy as compared to most sriracha sauces, this one has a pleasantly sweet garlic flavor. The sweetness reminded me of Vietnamese tuong den pho sauce, which I like very much. This would make an interesting marinade, and seems great for people who prefer a milder hot sauce. I would definitely try this again. I also really liked the sample packaging for on the go, much more convenient than a bottle. Tried this prior to having a few drinks, and though the consistency of this was quite interesting ( think jello shots) no hangover the next day. It didn’t taste bad, but the jello-like texture made it hard to drink. All the vitamins and the fact you are drinking a tall glass of water prior to drinking definitely helps in preventing feeling sick the next day, so overall I think this is a pretty cool product. Gummy candy has got to be one of my favorites. I really liked the fact these were sour on a nice level, not overbearing. All the flavors tasted good, the only bad thing is they are hard to share! This lip gloss is made with medical-grade lanolin, I immediately knew it would be extremely moisturizing; and gladly I was not disappointed.Â The shade is a very subtle and shimmery pink. The formula is not at all sticky or heavy on your lips. On top of it, it had a handy mirror on the side and a LED-lit applicator!! These would make awesome gifts for Christmas, highly recommend it. Thanks to my Goodie Boxes, I discovered this awesome makeup brand- Mirabella. I love, love, love this eyeliner. The felt tip reminded me of Kat Von D’s liners, it applied even and was very easy to use. This is the type of eyeliner people who are new to makeup and pros can both easily use. It is a nice light black shade, and since it applies very easily, you can work more product to make it a darker and more intense black. 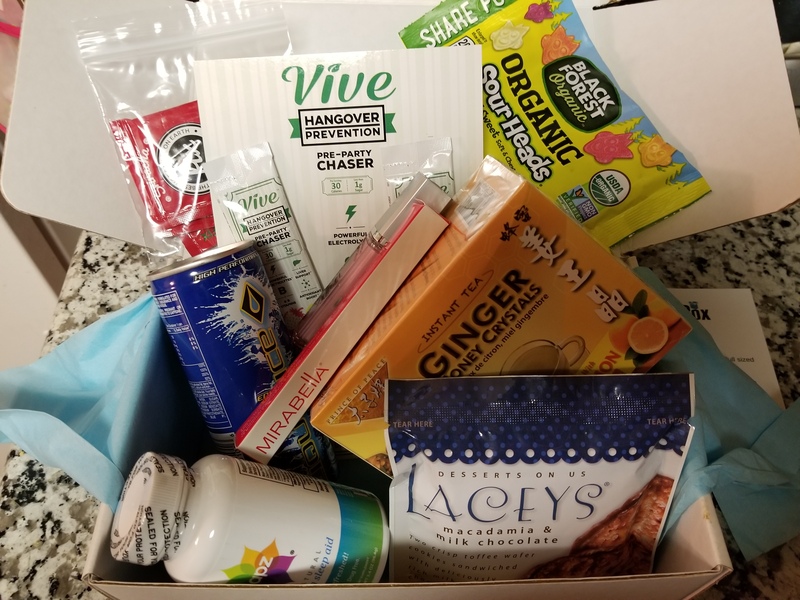 Loved all the products in this month’s Daily Goodie Box! Have you tried any of them? !